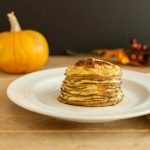 Pumpkin Cheesecake Pancakes Low Carb are wonderful sugar free treat breakfast. Preheat griddle to 350 F (170 C). Add all the pancake wet ingredients except for the water into a blender or processor, & blend. Add the dry ingredients and blend until smooth. Add water, a little amount at a time until pancake batter has the right consistency (not super thick or too thin and runny). Pour a small amount of batter (it is easier to flip smaller sized pancakes) onto a preheated well oiled griddle or pan. Cook for 3 to 4 minutes until browned and the edges of pancake almost to the center are dry. Flip and cook the other side for 2 to 3 minutes. I like to place the done pancakes on a oven safe plate in a warm oven (200 F or 93 C) to make sure pancakes stay warm while others are cooking and helps with any not quite all done in the center pancakes. For the Pumpkin Cheesecake Topping, add all pumpkin cheesecake topping ingredients to a magic bullet type blender or processor. Blend and whip together until creamy. Spread each pancake with a tbsp of pumpkin cheesecake spread and drizzle with sugar free maple syrup and garnish with chopped pecans if desired.